Its social purpose is presenting information about something. They generally describe an entire class of things, whether natural or made: mammals, the planets, rocks, plants, countries of region, culture, transportation, and so on. – Use of paragraphs with topic sentences to organise bundles of information; repeated naming of the topic as the beginning focus of the clause. – General nouns, maksudnya adalah, suatu benda (baik itu hidup atau mati) yang bersifat umum. Coba bandingkan : Hunting dogs >< My dog. Hunting dogs bersifat umum; sedangkan my dog bersifat khusus. – Relating verbs, dalam grammar disebut juga dengan linking verbs. Seperti to be [is, am, are: present], seem, look, taste dan lain sebagainya. – Timeless present tense adalah salah satu penanda waktu dalam simple present seperti “often, usually, always” dan lain-lain. – Technical terms, maksudnya adalah istilah-istilah yang meliputi teks report tersebut. Misalnya tentang “music” maka, istilah-istilah musik harus ada. Read the text below, and see the translation. Once upon a time, there lived in Japan a peasant and his wife. They were sad couple because they had no children. They kept praying to their god pleading to give them a child. While cutting wood by a stream one day, the man saw a large peach floating on the water. He ran to pick it up. His wife was excited because she had never seen such a large peach before. They were about to cut the peach when they heard a voice from inside. The couples were surprised to do anything. The peach then cracked open, and there was a beautiful baby inside. The couples were very happy, of course. They named the baby Momotaro, which meant ‘peach boy’. Momotaro grew up to be clever, courage young man. His parents loved him very much. One day, Momotaro told his parents hat he was going to fight the pirates who always attacked their village. These pirates lived on an island a few kilometers away. Momotaro’s mother packed his food, and his father gave him a sword. Having blessed Momotaro, they sent him off on his journey. Sailing on his boat, Momotaro met an eagle going in the same direction. They became good friends; soon, both of them arrived on the island of the pirates. Momotaro drew out the sacred sword his father had given him and began to fight the pirates. The eagle flew over the thieves’ heads, pecking at their eyes. Finally, the pirates were defeated. Momotaro brought home all the goods that pirates had stolen. His parents were proud of him, and they were overjoyed at his victory and save return. 1. The generic structure of the text is… . 2. Who is the main character in the story? 3. “Having blessed Momotaro, they sent him off on his journey.” (paragraph 5) From the sentence we know that Momotaro’s parents …. Him to fight the pirates. 4.When the peasant and his wife saw a beautiful baby boy inside the large peach, they ….. and named him Momotaro. c)seemed afraidd)were very glad. e)looked surprised. 5. What do we learn from the story? Let us know more about how Debating has taken over the world and how it is important for Fluent English Speaking. The phrase “The world is a global village” is quite true because of the vast improvement in the communication network and the geographical borders having thinned down with businesses going global. Hence, this has made English Speaking one of the important aspects that are required to be competitive. So, if someone wants to improve their English Speaking skills, along with the add-on benefit of gaining knowledge by learning various dimensions on a subject, debating is the right tool to embrace. It would be creative to think that the word Debate could have come from two words “De” and “Bate” – Bate means angry in mood and De means negating – Debate should be something that negates an angry mood. Also, one might wonder how a discussion that has the possibility of triggering anger could actually bring it down. Hence, To answer that plain, debating is not about being argumentative as it is deemed to be understood. But a forum to discuss in a formal manner what one’s view is, on a subject. And, this free expression of views limiting to a laid set of rules is an enjoyable activity even if it involves engaging in a verbal challenge. So, thereby negating any emotions. The expression that practice makes a person perfect is absolutely true when it comes to developing any art. Vocabulary: Debates help learn more on a subject, improves listening skills and communication skills. Listening and communication skills, in turn, develop the vocabulary. Framing – Usage of words and structuring of statements (articulacy) wins over any audience you encounter. Intonation/rhythm of speech– This improves with the observation of self and the person who competes. Accent – One has to make constant efforts to work on developing an accent which is neutral so that he/she is well understood. The current competitive lifestyle has become such that irrespective of age, we are under the pressure of making an extemporaneous speech in English. See (Ex., Group discussion in an interview, presentation to an onshore visitor or investor at the workplace, etc.). In addition, it is to be noted that the fear associated with English Speaking in public could be well taken care of. Especially, once a person participates in a debate with an open mind. From our very own sage, Adisankara making refinements to the religious structure by conducting debates to convince people who were adamant about changes, to the current popular TV shows that debate on up-to-date happenings with the audience as speakers. So, it is not just the content and the style that matters but the linguistic skills that play an important role in making our point clear. So, let alone winning a situation. So, Debating is such a simple tool that to experience it you just have to start it at home. Exactly, like how charity begins!! Don’t debate over debate being the best and inexpensive tool for English Speaking.Just adopt and see the benefits for yourself. It could be the most empowering thing that someone could ask for. Berikut adalah beberapa frase dan contoh kalimat yang bisa digunakan untuk mengungkapkan atau mengekspresikanobligation (keharusan) dan necessary(keperluan). It is obligatory for the people to participate in education. Entering elementary school is compulsory in Indonesia. That’s a needless thing to speak with him. It’s unnecessary to sit under the tree for hours. There’s a legal obligation to enter the army. It’s compulsion to obey your parents. It’s a need for everybody to eat nutritious food. Is it necessity for man and woman to sit apart? My father obliged me to study every night. Every Muslim must pray five times a day. You ought to repair my watch. Those shoes should be repaired. I ought to wake up early. Kata “must” memiliki arti yang sangat kuat (strong). Penggunaan kata “must” ini memiliki makna lebih cenderung pada suatu keharusan yang sudah menjadi kewajiban untuk dilakukan. I think it’s not your necessity to follow the party. To sleep at noon is being my necessity. Untuk informasi selengkapnya, silahkan baca juga artikel kami mengenai Expressing Necessity Menggunakan “Must, Have to, dan Have Got to”. perceived or believed, both by teller and listeners to have taken place within human history. Indonesia has many legend stories. They are included into narrative text. Narrative text has social function they are to amuse, to entertain, and to show moral values indirectly. The generic structures which construct narrative text are orientation, complication and resolution. The introduction part which consist of what is in the text in general. sontent of a narrative text. The part when the conflict tends to be decreased and ended. This part is when is the ccharacters get the solution of their conflicts. Then finally the conflict ended as the story ends. Legend of Mount Wayang. The Legend of Telaga Biru and etc. Once upon a time,there lived a mighty young man named Serunting in Semidang, South sumatra. He was very powerful due to the fact that he was the son of a powerful giant and a princess, Princess Tenggang. Serunting had a brother-in-law named Arya Tebing, Arya Tebing’s sister was Serunting’s wife. The two young men quarreled becouse of Serunting’s jealousy over Arya Tebing. Each of them had rice paddies, side-by-side, separated by a decayed fallen tree. On this tree, some mushroom grew. The ones that grow overlooking Arya Tebing’s rice paddy turned into gold, while those that grew overlooking Seruntin’s turned into useless thatch grass. This made Serunting envious. No matter how hard he tried to move the tree, the mushroom overlooking Arya Tebing’s rice paddy remained gold. Eventually, a violent fight broke out between them. Knowing that Serunting was mightier than him, Arya Tebing gave up fighting. He persuaded his sister to find out Serunting’s waekness. She told Arya that Serunting concealed his soul in the highest thatch grass, which remained unshaken even mhen the wind blew on it. The next day, both young men resumed their fight. Having learned the secret, Arya Tebing pierced the thatch grass with his spear. Serunting fell and his leg was badly injured. Serunting knew that his wife had betrayed him so he left angrily. He haeded to Mount Siguntang and asked the god of Mahameru for mighty powers. The god told him to sit and meditate under a bamboo tree until his body was copletely covered by the bamboo laeves. Serunting did that for two years and succeeded in getting the mighty powers. Whatever words he spoke would turn into curse immadiately. From then on, people called him “Si Pahit Lidah” (the bitter tongue). Woe to him who dared oppose Serunting. Everybody feared him becouse everyone who opposed Serunting was turned to stone by his curse. 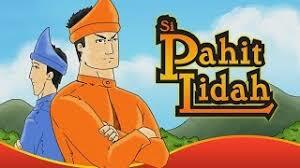 Si Pahit Lidah, however, was not convinced yet of his power. To make sure that he really had magic power, he pronounced a curse on mellowy sugar-cane growing on the bank of lake Ranau. crossed his way. Everyone along he came across he turned to stone. Everywhere along the Jambi River people can point out the spots where Si Pahit Lidah spoke his deadly curse. It stands to reason that he was the fear of everyone. There was not much needed to make him angry and the result were fatal for the person, for the victims turned to stone. A girl who, just for a joke, answered his question about the way to her village with ‘Under your feet, underwent the same fate. Little had she expected she had spoken her death sectence. People found her like a cold image with her gold chain on her neck, her rings on her finger and her bracelets around her wrists, but everything was stone. 1. What made Serunting became a mighty man? 2. What was the quarrel between Serunting and Arya Tebing about? 3. How did Arya Tebing defeat Serunting? 4. How did Serunting feel when he lost the fight? 5. When did Serunting get the power from the God of Mahameru? 2. The cause of the quarrel was in fact jealousy about mushrooms growing on the bark of the fallen tree. Mushrooms facing Aria Tebing’s rice-feld became only useless plants. 3. Took up the fight egain and pierced the high grass plant with his spear. 5. After being spat at and after having remained under a cluster of bamboo trees without taking either food or drink till the leaves of the bamboo had covered him. A long time ago, in a small village near the beach in West Sumatra lived a woman and her son named, Malin Kundang. Malin Kundang and his mother had to live hard, because his father had passed away when he was a baby. Malin Kundang was a healthy, dilligent, and strong boy. He usually went to sea to catch fish. After getting fish he would bring it to his mother, or sell the caught fish in the town. One day, when Malin Kundang was sailing, he saw a merchant’s ship being raided by a band of pirates. With his bravery, Malin Kundang helped the merchant defeat the pirates. To thank him,t he merchant allowed Malin Kundang to sail with him. Malin Kundang agreed in the hope to get a better life. He left his mother alone. Many years later, Malin Kundang became wealthy. He had a huge ship and a lot of crews who worked loading trading goods. He was also married to a beautiful woman. When he was sailing on his trading journey, his ship landed on a coast near a small village. The local people recognized that it was Malin Kundang, a boy from the area. The news ran fast in the town; “Malin Kundang has become rich and now he is here. Enough, old woman! I have never had a mother like you, a dirty and ugly woman!” After that he ordered his crews to set sail to leave the old woman who was then full of sadness and anger. Finally feeling enraged, she cursed Malin Kundang that he would turn into a stone if he didn’t apologize to her. Malin Kundang just laughed and set sail. Suddenly a thunderstorm came in the quiet sea, wrecking his huge ship. He was thrown out to a small island. It was really too late for him to avoid his curse; he had turned into a stone. 1. Why did Malin Kundang and his mother have to live hard? 2. What happened many years after Malin Kundang join the sail? trading goods. He was also married to a beautiful woman. 3. Why did an old woman feel happy to see a ship leaned on in the beach? to hug him to release her sadness of being lonely after a long time. Read the following sentences aloud and find a the indonesian meanings! 2. Beach= An area of sand sloping down to the water of a sea or lake. 5. Merchant= A business person engaged in retail trade. 6. Pirate= Someone who robs at sea or plunders the land from the sea without having a commission from any sovereign nation. 7. Sadness= Emotions experienced when not in a state of wellbeing. 8. Sailing= The work of a sailor. A narrative text is an imaginative story to entertain people (teks narasi adalah cerita imaginatif yang bertujuan menghibur orang). # Resolution : Where the problems in the story is solved. Masalah selesai, secara baik “happy ending” ataupun buruk “bad ending”. Kadangkala susunan (generic structure) narrative text bisa berisi: Orientation, Complication, Evaluation, Resolution dan Reorientation. Meski “Evaluation” dan “Reorientation” merupakan optional; bisa ditambahkan dan bisa tidak. Evaluation berisi penilaian/evaluasi terhadap jalannya cerita atau konflik. Sedangkan Reorientation berisi penyimpulan isi akhir cerita. – Direct speech. It is to make the story lively. (Snow White said,”My name is Snow White). The direct speech uses present tense. Once upon time, there was a beautiful girl called Cinderella. She lived with her stepsisters and stepmother. They were very bossy. She had to do all the housework. One day an invitation to the ball came to the family. Her stepsisters did not let her go, so Cinderella was very sad. The stepsisters went to the ball without her. Fortunately, the good fairly came and helped her to get to the ball. At the ball, Cinderella danced with the prince. The prince felt in love with her then he married her. They live happily ever after. (Dahulu kala, ada seorang gadis cantik bernama Cinderella. Dia tinggal bersama saudara tiri dan ibu tiri nya. Mereka sangat suka memerintah. Dia harus melakukan semua pekerjaan rumah tangga. Suatu hari sebuah undangan untuk sebuah pesta datang ke keluarga itu. Saudara tiri nya tidak membiarkan dia pergi, sehingga Cinderella sangat sedih. Saudara tiri pergi ke pesta itu tanpa dia. Ball : diartikan pesta bukan bola. 1. Analisa generic structure dari text yang berjudul Cinderella diatas ! 2. Apa moral value (nilai moral) yang dapat diambil dari text diatas? Translate the text above into Indonesian !